There once was a boat called Escape Velocity. 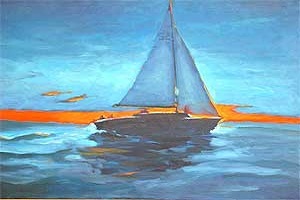 While sailing on it with dear friends, I often thought about the name and what it meant. Sailing is not exactly a fast sport, so I had a hard time relating it to the defined “speed required to escape the atmosphere”. It seemed nonsensical; so I pondered other possible meanings. “Adequate speed is essential in all of life, as is in sports. Life is time, so to live wisely we must manage time…” on and on and on I went in my mind… between each tack and jibe, there was ample time for thinking, while we kept our cheeks to the teak and heard the water gushing beneath our hanging feet. I went on to consider time in reference to life and events. I recalled what I had read in Ecclesiastes 3:1 “To everything there is a season, a time for every purpose under heaven”. These words make universal sense. They make the same sense as those in Kenny Rodgers song “The Gambler”: “you gotta know when to hold ‘em, know when to fold ‘em, know when to walk away, know when to run”. Truly one should try hard and learn to read the seasons of life. When you are sailing in a regatta, it is crucial to know when to tack. That is why a good tactician plays such a key role in any sailing crew. The tactician is the one that signals the time to change course according to the wind, the mark to reach and the positions of the other boats competing. If he is early, he will probably cause the boat to make more tacks (or jibes) than needed to complete that leg of the race, and therefore waste precious time. While if he is late, other boats will run a shorter course than his. My friend Ivan Murphy, owner and captain of Escape Velocity, led its crew to win the Banderas Bay Regatta three years in a row – and then quit. He was happy with the three wins and decided to seek other pursuits. Other sailing friends, on various occasions, have shown me examples of timeliness worth learning from. Bill, for instance, sailed until he was 81. Then one morning he came by and informed me he was selling his boat, a sloop named Koloa which he had kept in perfect shape and where he had lived and sailed for many years. We celebrated one last breakfast all by ourselves and then we hugged good-bye. He then went to his loved ones, spent one great month enjoying grand-children and passed on peacefully – everything in order, all in due time. It seems to me there is way too much speed in present lifestyles. People in general appear to be rushing to win an ever faster world race. I am grateful to have grasped the velocity to escape.